Road biking and mountain biking enthusiasts are gearing up for a summer in Steamboat Springs packed with events including the Rio 24 Hours of Steamboat Mountain Bike Race, The Tour of Colorado (Steamboat Springs loop tour), Ride the Rockies and the Tour de Steamboat. Spring temperatures enticed diehard biking enthusiasts out onto the roads around Steamboat Springs weeks ago. Now, with the Steamboat Ski Area officially closing for the 2006/2007 ski season last Sunday, the mountain biking community is rearing to go. This summer in Steamboat is packed with more renowned road biking and mountain biking events and tours than ever before. ResortQuest Steamboat Springs Vacation Rentals is the official lodging sponsor of the Annual Rio 24 Hours of Steamboat mountain bike race, The Tour de Steamboat and the Ride The Rockies. ResortQuest is offering participants a variety of Steamboat lodging packages and special rates specifically for these events. Alternatively, guests can take advantage of the "I Love Steamboat" packages which offer lodging discounts combined with a Steamboat Chamber Gift Certificate. Gift certificates can be used at any Steamboat Chamber member business. The Annual Rio 24 Hours of Steamboat mountain bike race is less than two months away! Mount Everest, the world's tallest mountain, rises 29,035 feet into the sky. In slightly more than 24 hours -- from noon Saturday June 9 to just after noon Sunday June 10, 2007 -- riders will climb roughly 36,000 vertical feet on the Steamboat Ski Area's Mount Werner. Most 24-hour mountain bike rides feature far less climbing than the nearly 2,400 feet the riders conquer in every lap of this race. Steamboat's 24 hours mountain bike race has become renowned as one of the world's most challenging 24-hour mountain bike race. Riders ascend Mt Werner, starting from the base of the gondola, past the Torian Plum condominiums, up Zig Zag to the top of the gondola and descending to the Start/Finish line via the Valley View trail. The singletrack climbs Mt Werner through aspens and overlooks the beautiful Yampa Valley and Steamboat Springs. On June 17, 2007, The Denver Post Ride the Rockies road biking tour will pass through Steamboat Springs. The Denver Post Ride the Rockies is an annual bicycle tour that takes 2,000 cyclists on a six- to seven-day ride on paved roads through Colorado's Rocky Mountains. The Ride the Rockies route differs each year but always climbs a few challenging mountain passes and showcases Colorado's spectacular scenery. The 2007 tour, June 17-23, will be the 422 mile Frisco-to-Frisco loop. Day One will start in Frisco and end up in Steamboat Springs. Daily bike rides can be as short as 35 miles or as long as 100 miles, but generally average 60-65 miles. Just one week later, the Bicycle Tour of Colorado will commence the week-long Steamboat Springs Loop Tour through the Colorado Rockies. From June 24-30, 2007, road cyclists will ride over the Continental Divide six times as they travel to and from Steamboat Springs via Walden, Winter Park, Copper Mountain, Leadville and Kremmling. Throughout the tour of Colorado organizers provide camping services, route maps, road marking, aid stations every 15-25 miles, bicycle-repair services, and medical support. Later in the summer, cyclists return to Steamboat for the revived Tour de Steamboat road biking tour. The Tour de Steamboat Century Road Ride, August 11, 2007, is a non-competitive road biking tour covering more than 100 miles on a point-to-point course climbing and descending Rabbit Ears, Gore and Yellow Jacket passes. Registration is limited to 500 riders. Throughout the summer, beginner to advanced mountain biking enthusiasts can participate in the Steamboat Springs' Town Challenge Mountain Bike Series, a well-organized mountain biking competition series for all ages and ability levels. Races are on Wednesdays from May 23 through August 17, 2007. The race location changes for each race and varies between Howelsen Hill and Mt. Werner. If endurance and competition is not your thing, there are plenty of trails to explore in your own time around the town of Steamboat Springs, the Yampa Valley and the Routt National Forest. 50 miles of trails make Steamboat Ski Area the place to go for mountain bike thrills. If the 2400 foot climb seems daunting, take the Steamboat Gondola up to Thunderhead and take an exhilarating ride down. Explore all the different trails on the mountain suitable for advanced beginner, intermediate and experienced mountain bikers. Howelsen Hill offers fantastic singletrack riding immediately accessible from downtown Steamboat Springs. Billed as a quick ride to squeeze in before and after work, the Howelsen Hill Loop, it climbs 2.3 miles to a rock quarry before ripping down steep, rocky, and hard-packed singletrack. For a gentle ride with the kids, take the 5-mile Yampa River Trail, which connects the ski area to Howelsen Hill in downtown Steamboat. In Steamboat, ResortQuest luxury vacation rentals are accompanied with premier guest services including Steamboat's only on-call, door-to-door shuttle service, 24-hour front desk service, daily housekeeping and Wine and Cheese Welcome receptions. ResortQuest, one of the nation's leading vacation rental management and resort real estate companies, provides a one-stop resource for North America's premier resort destinations, ResortQuest.com. ResortQuest is the largest marketer and management company of vacation condominiums and leading vacation rentals in the U.S. and Canada, based on a portfolio of nearly 17,000 properties, from Fort Walton Beach to Hilton Head rentals, with a combined real estate value estimated at approximately $7 billion. ResortQuest Real Estate is one of the nation's leading real estate companies, focusing exclusively on resort properties, offering superior brokerage services in the country's premier beach, ski and golf destinations. ResortQuest employs more than 4,000 people and is owned and operated by Gaylord Entertainment Co. (NYSE: GET), one of the largest and fastest growing companies in the hospitality and entertainment industries, based in Nashville, Tenn., that also owns and operates Gaylord Hotels and the Grand Ole Opry. For more information, visit ResortQuest.com or GaylordEntertainment.com. 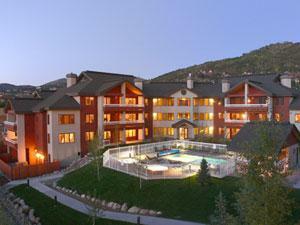 ResortQuest at Bronze Tree Condominiums in Steamboat Springs, ColoradoThe Bronze Tree is a ski-in/walk-out property located just across from the Steamboat Ski Area's Christie Chairlifts and just steps from the shops and restaurants of Ski Time Square. 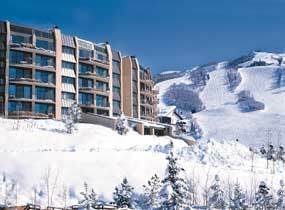 From the private balconies and large picture windows, up to six stories high, guests delight in the panoramic views of the Steamboat Ski Area and Yampa Valley. ResortQuest at Trappeur's Crossing Resort in Steamboat Springs, Colorado Trappeur's Crossing Resort presents Steamboats finest resort experience. Conveniently located in the heart of the Steamboat Mountain Village, only two blocks from the Steamboat Ski Area, Trappeur's Crossing Resort is just a short stroll to the restaurants, bars and shops of Gondola Square.